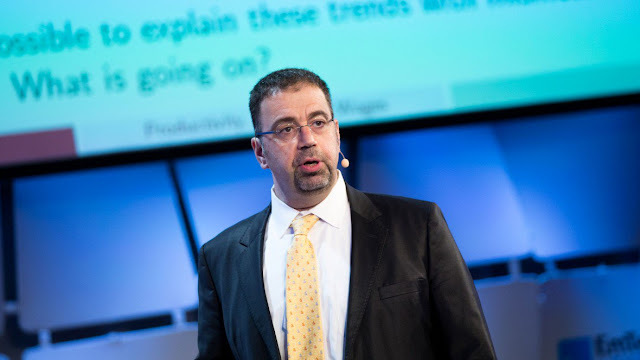 MIT economics professor Daron Acemoglu, a leading voice on the impact of technology on the economy..spoke yesterday at MIT Technology Review’s EmTech Next conference in Cambridge, Massachusetts. His central message: societies must invest in education and welfare services in order to realize the full benefits of robotics and AI. “It’s not anyone’s responsibility by themselves; it’s our collective responsibility,” he said. How can you say something like this if you understand that markets clear? How can you say something like this if you understand that capital will flow to support education when the markets make clear there is demand exists for such in an economy? What is this "not creating jobs" nonsense? Markets clear, until we return to the Garden of Eden, there will always be jobs. And if AI replaces some workers, this means there is more product being produced. That is, AI does the job of former workers, who are then free to work creating other products or services. More product and services means a generally higher standard of living. "Contribute to the solution"?! There is no problem!